The Model 972 Solid State Loop-Powered Vibration and Temperature Sensors are specifically designed for industrial machinery monitoring. The Sensor continuously measures both vibration level and temperature, key machinery health parameters, and transmit the data directly into a PLC, providing accurate level monitoring and with support alarm and machinery shutdown capabilities. The vibration level output indicates either Velocity or peak Acceleration with factory set ranges of 0-1, 0-2, and 0-5 inches/sec and 0-10, 0-20, and 0-50Gs pk respectively. The frequency response range is from 5 to 2000Hz and ±5% accuracy is maintained over an operating temperature range of from 0 to 100 degrees C.
The sensor is offered in two case styles, both of which are case isolated with outputs accessible via standard 4 pin connectors. The Model 972-H1 is mounted with an integral ¼-28-socket head cap screw which allows the case to be rotated to any 360 degree position prior to lockdown. 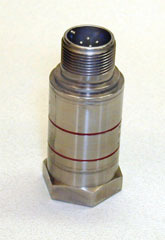 The 972-H2 is mounted with a removable ¼-28 base mounting stud. Consult the factory for customized versions of these sensors.